Need a healthy and fun snack for a party, get together, or dish to pass? These caterpillar kabobs are simple to make and absolutely irresistible to both kids and adults alike. 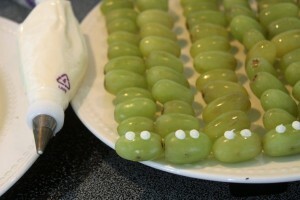 A bunch of grapes are transformed into loveable and edible little critters with a couple simple ingredients. I love anything that makes eating healthy and fresh foods fun for the kids. 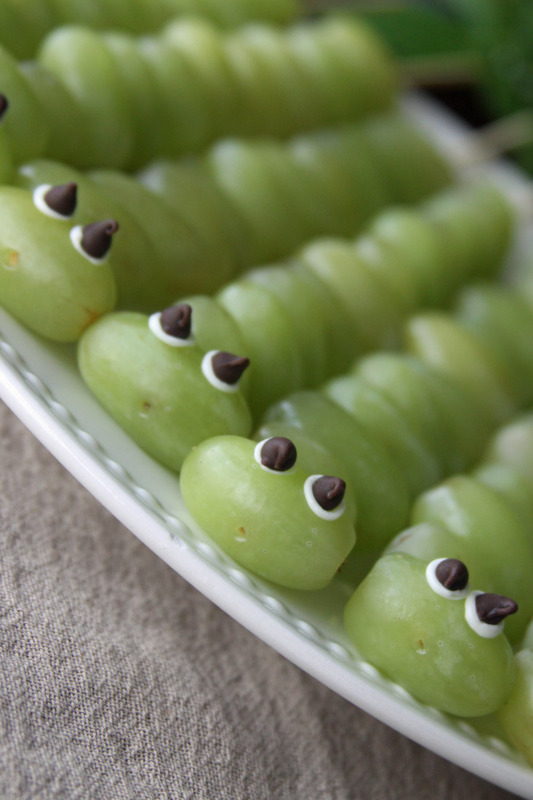 Grapes are always a favorite snack for the kids but when you transform them into these adorable little caterpillars they are hard to resist no matter what your age. I found this fabulous ideas on… you guessed it… Pinterest where someone used these adorable Caterpillar kabobs as party of a woodland themed party. They were just so simple and adorable that I couldn’t wait to make them for the kids. When it was my son’s turn to provide snack for his class this month, this was first on my list. He said that the kids loved them, and there wasn’t a single caterpillar left after snack time. He was so excited to help me make them and to take them to share with his friends at school. These are so simple to make, and a great thing for the kids to help make in the kitchen. I had everything else that I needed to make this in the cabinets and just needed to buy a bunch of grapes. One good sized bag of grapes made about 12 caterpillars with 12 grapes on each stick. You will also need some wooden skewers, white frosting, mini chocolate chips, and an icing bag. I put the grapes onto the skewers with the “heads” of the caterpillars at the blunt (not pointy) end of the skewers. My hope was that the kids would be able to eat them of the sticks without poking themselves and that they could safely hold the other end of the skewer in their hand. 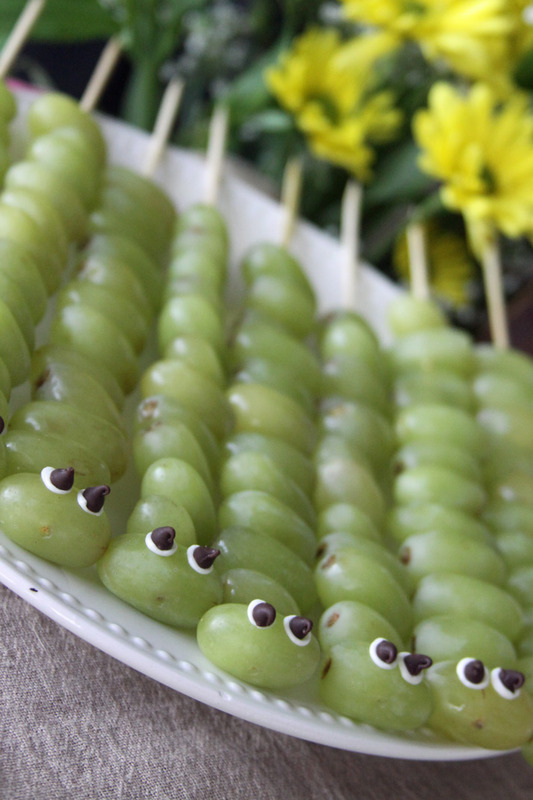 I put the grapes onto the skewers horizontally to create a nice fat little caterpillar. 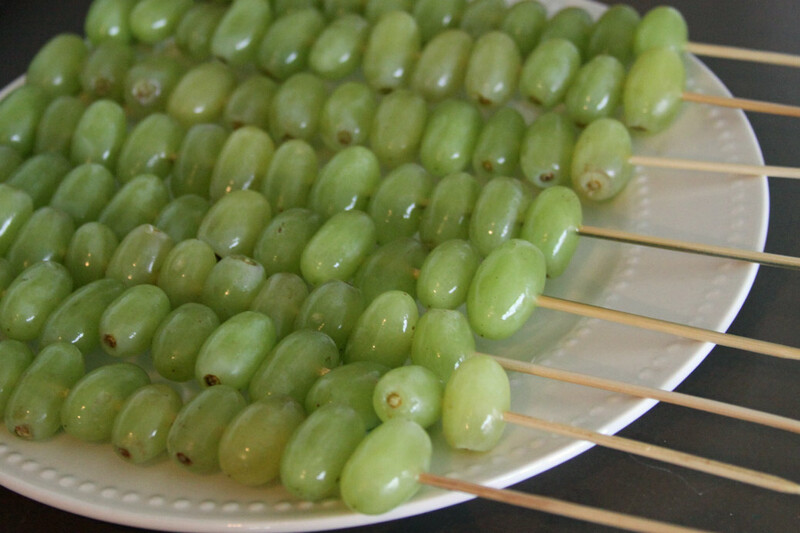 I lined 12 grapes in a row on each skewer and that left just enough room at the end for a little hand to hold. This is a great step to get older kids involved in. They might not look perfect, but they enjoy the process. Next I filled a small icing bag about 1/4 of the way full with some pre-made white frosting. I had a container in the fridge with a little leftover from a cake I decorated so I didn’t need to open a container just for these. It uses such a small amount of frosting that you could just buy a little tube of icing at the store. That way you wouldn’t even need to use an icing bag and skip the mess. I made sure the grapes were cleaned and dried before I added the eyes. The frosting was at room temperature before I started decorating as well. 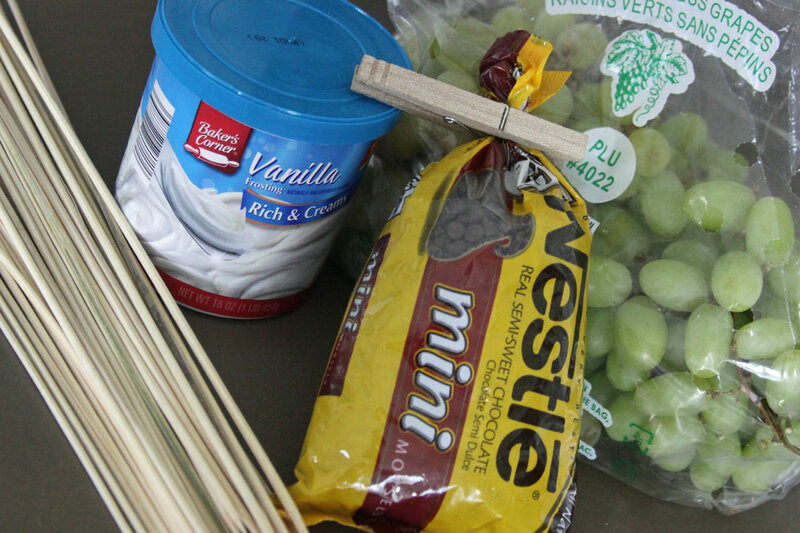 I was worried that the frosting wouldn’t stick to the grapes, but it worked great and it was super quick and easy. I added two dots on each caterpillars head to make the eyes. I then pushed one mini chocolate chip onto each white dot to create the most adorable little googly eyes. With a tiny amount of frosting and a handful of chocolate chips, simple grapes transform into adorable caterpillars that are totally irresistible. 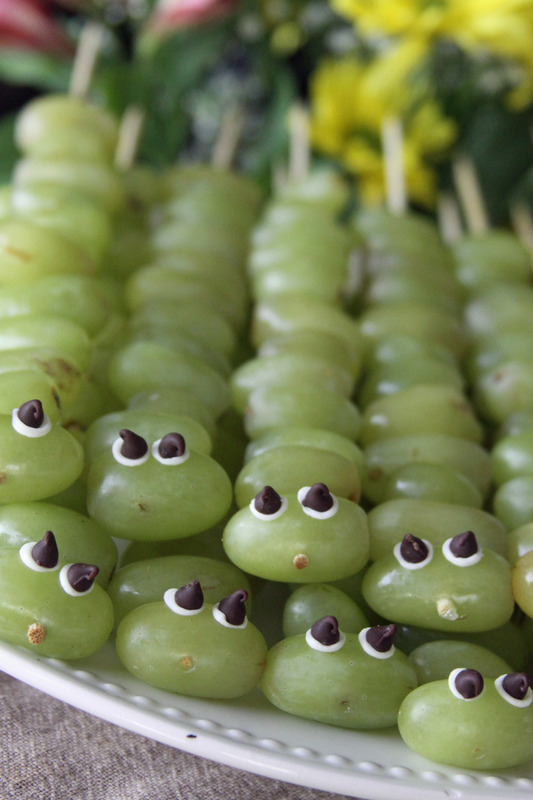 What a fun way to get your kids excited about eating healthy foods! These made the perfect snack for my son to take to school and were a totally hit with his friends. I made them the night before and just stored them in the fridge overnight which makes them a mom friendly snack to make as well! The next morning I could just grab them and send the little guy off to school with a snack that is as fun as it is healthy. I would definitely make these again for a kid friendly snack, party, cookout, or any get together that kids will be attending. They are so simple that I would even make them for a fun picnic lunch at home just for fun or an after dinner dessert! Super cute! Amazing how adding the eyes turns them right into adorable little creatures! I’ve seen this on Pinterest as well, but I wanted some info about how school-snack friendly this is. I had to look around and I finally found your page and I want to say thank you for including that part of it. Those little things sure make a difference! AWESOME!! So happy to hear that this is a great option for older kids too!! What’s not to love about alien kabobs?! Thanks for sharing! This is an adorable Idea!! I found you on Pinterest but I am going to share this post on my Facebook Page Mommy Trying 2 Survive Monday! I would love for you to come check us out! I made these with my young Beaver Scouts (6-8 year olds) on our sleepover at the weekend. The theme was ‘Pirates’ and I called these weevils. They also make disgusting Hardtack biscuits to go with their weevils! Thank you for the fab idea!